On 10th March 1999 The Space Hijackers held a party on London Undergrounds Circle Line, it attracted around 150 people and lasted for just over 1 lap of the circle before we all scarpered. With a mobile sound system and lights disguised as luggage we decorated the train and danced the night away. 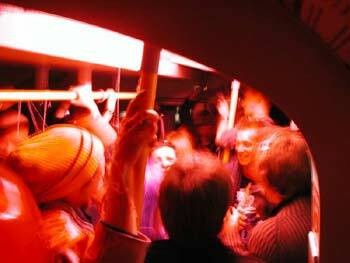 On 14th March 2003 We held our second Circle Line party, this time around 600 people came and packed out 4 carriages of the train, we lasted for just under 2 laps before British Transport Police terminated the train. The party included DJ's, A Samba Band, A Knitting Circle, Naked Pole Dancing, Tequila Bars, Limbo Poles and much much much more. Planning and pulling off a party such as these takes a bit of work, a lot of time and a team of people. We decided to make this page so that other people could benefit from our experience and hold bigger and better parties for us to attend in the future. The basic premise for a party on the circle line is that you attempt to get everyone on board, set up everything, have your party and clean up without the authorities ever getting wind of what is going on. This is a lot easier said than done. A Date, Time and Meeting Place We have found that the best time to have a party is on a weekday starting at around 8pm, this means that the tubes are fairly empty and the people on board are either on their way home after having had a few beers, or on their way out for the evening and up for a party. The meeting place has to be close to a tube station,, but not directly outside so as to attract attention before you have even got onboard. Pick a big station to join so that when your crowd of party goers arrives it does not look too out of place, the best ones are probably those connected to mainline railways. Sound & Entertainment No party is a party without some music, look at how many people you expect to get and plan your sound accordingly, each carriage of the train holds around 150 people. The simplest way of getting music on board is to use big portable stereo's, but this means lots of different sounds. If you can get hold of some portable busking amps these are much better as you can wire a portable CD player to output to several amps and then have the same sound system playing all over the train. Safety Safety is paramount, have at least two of your group in each carriage to ensure that people are safe and that people know what is going on at all times. You do not need to be warders, or authority, just stop people from going to the toilet between carriages etc. Publicity How do you get people to your party without every reporter, flash mobber, police man, FIT team, and Ken Livingston turning up? 1 - The party should happen on the back carriages of the train - this is so that you are as far as possible from the driver, the back carriages are generally the emptiest (no station exits are at the back of the platform) so by partying here you should be the least trouble and arouse the least awareness of what is going on. 2 - The party should only happen in the tunnels, once you hit a staion, the music should stop, everyone should be quiet and act normal! As soon as you pull back into a tunnel, let rip with the music again and dance your socks off. This will make people less wary of getting on the train, and will make it less obvious to LU staff what is going on. It also makes a very very strange atmosphere in the train in the station. 3 - You can not smoke on the trains - This sets off an alarm in the drivers compartment and he will find out what is going on. 4 - There are no toilets - Hopefully your meeting place has a toilet nearby - due to the shape of the circle line it is possible to leave the circle at one point, go to the loo and then cut across London to catch the same train at a different point. i.e. you can get off at embankment, use a nearby public loo then travel up the bakerloo line to catch the party train again at Baker St. Other similar routes are available. 5 - You must explain to people that you are not there to be their parents, once you are on the train people must be responsible for themselves and the people around them. If the party is going to work, and you are not going to piss off other people, then people must be responsible, ie, not trash the train, not get too drunk and leary etc. Once on board you are simply a group of people on a train, and no one is incharge, no one should point fingers if the authorities turn up, and everyone should be responsible for their own actions. OOOOoooohhh self government? That sounds a bit like anarchy! 6 - The random people on the train are as important as everyone at the secret meeting point. It must be made clear that it is everyones party, the idea is not for your party goers to have a wild party on the train whilst everone else sits in their chair wishing they had caught the next one. As people get on, offer them sweets, offer them drinks, make them feel welcome, and who knows they might just stay on for an extra lap. 7 - Getting on the train, the simplest way to do this is to go by the station clock. Pick the first clockwise circle line train after 8pm or something along those lines so that it is clear to people which one to board without a member of your group having to announce it on the platform. 8 - Arrange a meetup point for the end of the party, or if anything goes wrong, Aim to do a certain number of laps and then all get off, if you manage this and London Underground are not aware it means we can organise these parties more often. It is best to get one of your group to act as a spokesperson and to relay the above information to the crowd, that person can then give everyone the signal to make their way to the station. Once on board you will come to the realisation that the party is now a beast of it's own, and you will not have much control over what happens. Ensure the music is pumping, and everyone is having a good time. It is probably best to have one of your team in each carriage to see what is going on and to let each other know. You may have to smuggle the sound system out a few stops before hand if you get wind that the authorities have rumbled what is going on, although by that time people should be dancing and singing enough not to notice it's absence. Hey look at the amount of work we put into our last two, its about we got to attend a circle line party and not stress out constantly.